Pictures of Leh, the Ladakh capital, pictures from Tikse monastery, and pictures from a few villages along the Indus river. And of course pictures of their inhabitants, both grown‑up and little. 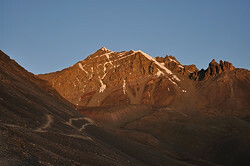 Photographs from our acclimatization trek over Stok La and from my quick visit to the Stok Kangri base camp. 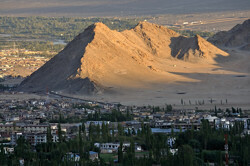 Both treks are close to Leh which makes them convenient to access but also rather busy. Nevertheless it is still possible to get away from the "crowds" there, fortunately. 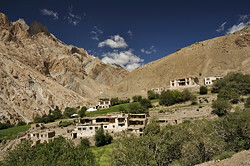 Images from our second trek from Phanjilla village over the Konzke La pass to the Zanskar river. We have started descending a bit earlier than planned because of health issues but saw many marvelous views nevertheless. 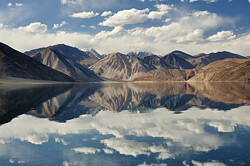 We have spent the last night in the mountains on the bank of the Pangong Tso lake. Even the way to get there over the high passes by car was very interesting and the lake itself was stunningly beautiful and felt impressively remote. I reckon places on the border with China in central Asia usually do.